Opened in 1906 by the Lord Mayor of Manchester who described it as a 'water palace of which every citizen of Manchester is proud', The Victoria Baths on Hathersage Road in Chorlton-on-Medlock were designed as a prestigious baths complex by Manchester's first City Architect, Henry Price back in 1902. No expense was spared in the design and construction of the Baths, Manchester having at that time one of the world's wealthiest municipal coffers. The façade has multi-coloured brickwork and terracotta decoration, the main interior public spaces are clad in glazed tiles from floor to ceiling and most of the many windows have decorative stained glass including the famous Angel of Purity. For 86 years, until its closure in 1993, the Victoria Baths provided both essential and leisure facilities. 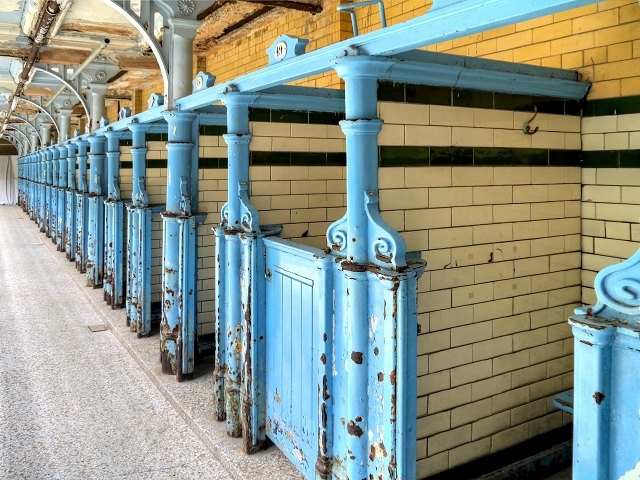 At the time of opening, few of the houses in the area had bathrooms so its 64 slipper baths or 'wash baths' were an important amenity and, between 1906 and 1993, Victoria Baths were used by thousands of people for swimming, bathing, washing, dancing and relaxing. The pool was the breeding ground for numerous swimming champions. However changing social conditions and patterns of leisure activities meant the Baths were less well-used and, as the Baths were expensive to run Manchester City Council could no longer justify (or afford) the costs to keep the building open and functioning and they were closed on 13 March 1993 despite local protests. Ten years later, Manchester’s Victoria Baths won £3m of Heritage Lottery funding through the first BBC TV “Restoration” programme. Thousands of viewers voted for the beautiful building, now widely recognised as the most intact and lavish example of municipal swimming pool architecture in the country, to receive the funding and an additional £2million has been raised by the Victoria Baths Trust.